I know I’ve been posting a lot of gardening stuff lately, but it is mid-May and that’s the main thing on my mind, lol! I’ve got my potatoes, tomatoes, peppers, and green beans in the ground, but I still have sweet potatoes, Indian corn, watermelons and more strawberries to plant (my first set of strawberries died in our extreme Kansas weather!). What have you all be planting??? Tell me in the comments below! Today I wanted to talk about planting flowers for your vegetables. Yes, you read that right. For your vegetables. What do you picture when you think of a garden? Probably long straight rows and growing green goodies, right?? Well, I’m here to turn that picture on it’s head. I’m telling you now, forget the monochromatic green. 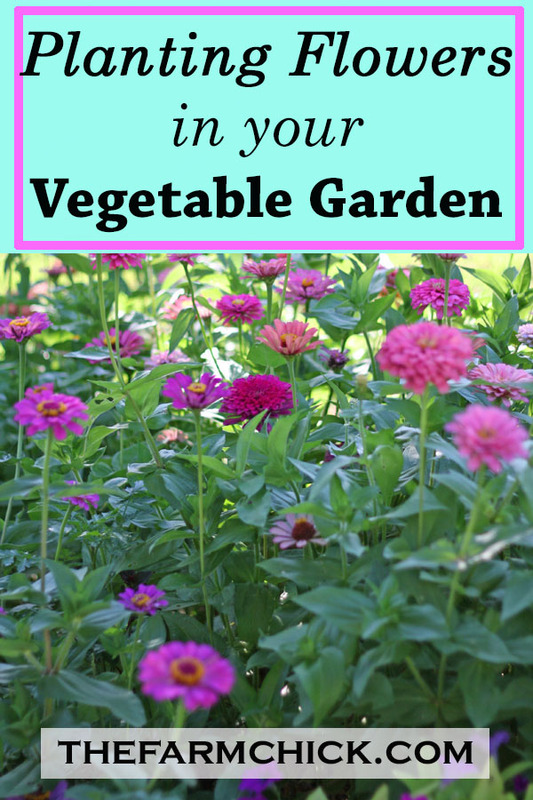 Plant flowers in your vegetable garden! This is a picture of my garden last year (which, if you’ve read my blog before, you may have seen!). See all my zinnias in the front?? Beautiful, right?? First of all, what insect loves flowers? And what insect can help pollinate your fruits and vegetables leading to increased yields? Trust me, if you plant flowers in your garden, the bees will find them with their highly specialized senses, and when they do they’ll take note of your flowering veggies and fruits. 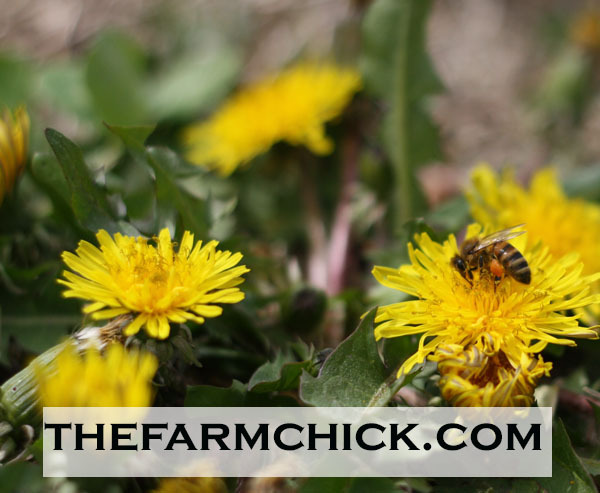 They’ll do their God given duty and give you some extra pollinating time. You get the added benefit of more produce to deal with, I mean, eat and preserve. The second reason for planting flowers in your vegetable garden is that you (or they, meaning the flowers) will attract beneficial insects. Now, they’re are too many types of beneficials for me to go into a lot of detail (plus I’m not an entomologist, lol! ), but I can tell you this- if you can get beneficial insects into your garden, they will wage war on the pesky, nasty bugs that are the bane of a gardener’s existence. The third reason for planting flowers in your garden is this- it just looks so gosh darn pretty! My mother-in-law tells me often of how her dad always planted a border of zinnias around his big garden every year. As a kid, she just thought that was the most beautiful thing ever and to this day, she LOVES zinnias! So, your flowers can also positively effect someone else for the rest of their life. Pretty cool, huh? 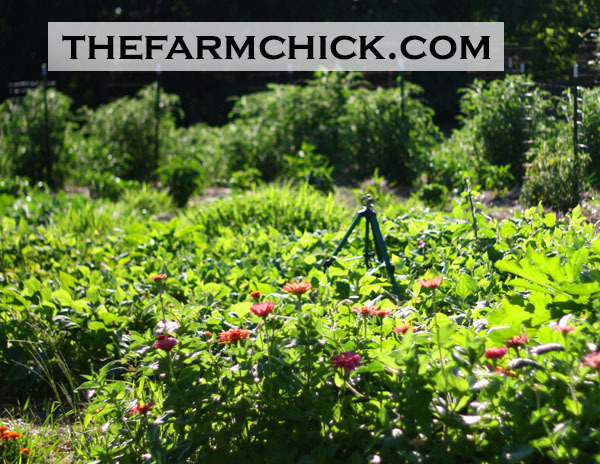 HOW DO YOU GO ABOUT PLANTING FLOWERS IN YOUR VEGETABLE GARDEN? Is there a right way and a wrong way? I encourage you to plant a variety and plant them within your vegetable plants. My two personal favorites are marigolds and zinnias. 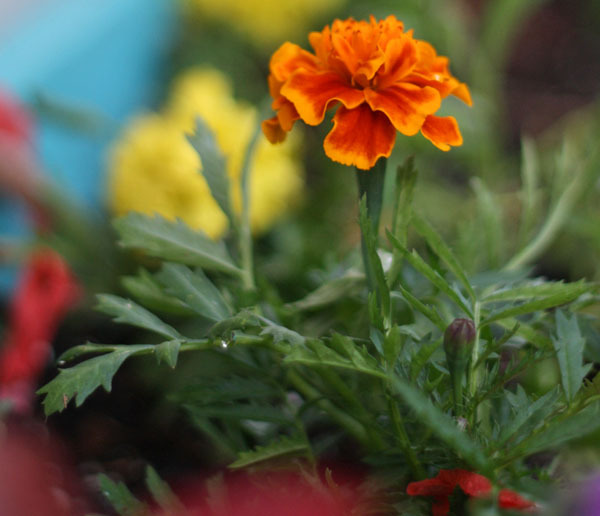 There are many claims that marigolds repel pests, which is somewhat true, although their powers only go so far. They won’t completely repel all bad bugs, but they will help some. I like to plant them in random clusters in my garden. 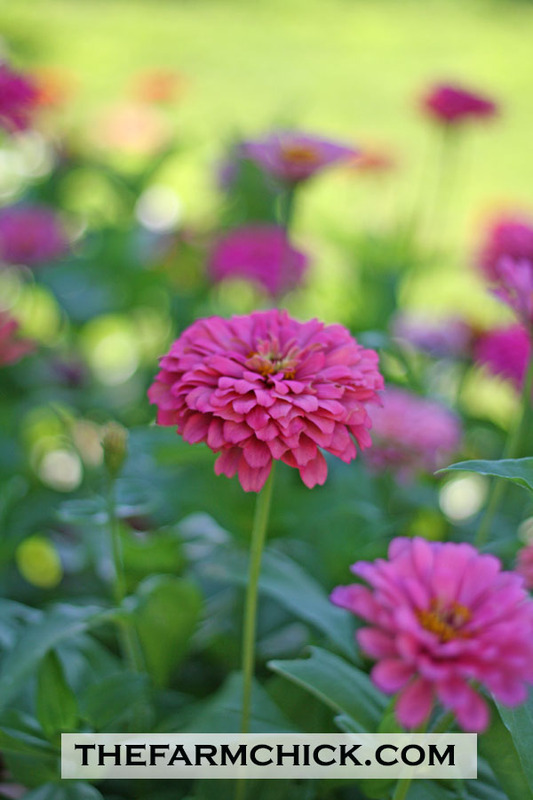 Zinnias are known to attract predatory wasps and hover flies, which in turn eat and destroy the damaging insects. They can also deter cucumber beetles and tomato worms (maybe this is why I don’t seem to get worms in my tomatoes??). My favorite, though, is that they attract hummingbirds! I love to watch those little critters 🙂 Hummingbirds also like to eat whiteflies, which can damage tomatoes, potatoes, and cucumbers. Plus, the bees and butterflies also LOVE these bright cheery flowers! I plant clusters in my garden and also try to border as much of my garden as I can. 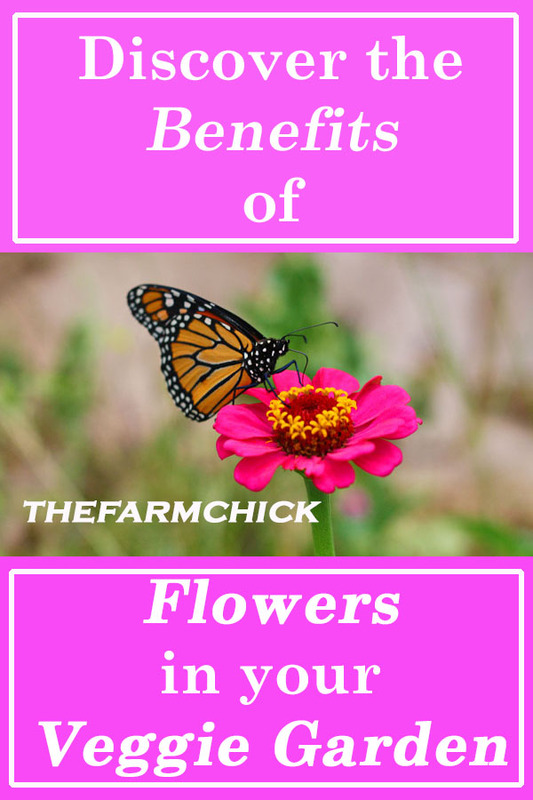 Another reason that I love marigolds and zinnias so much (besides their beneficial super powers) is that they are extremely hardy (and in our fickle and extreme Kansas weather I need all the hardy I can get!) and their seeds are really easy to save! All you have to do is save the dried flowers after they have died. 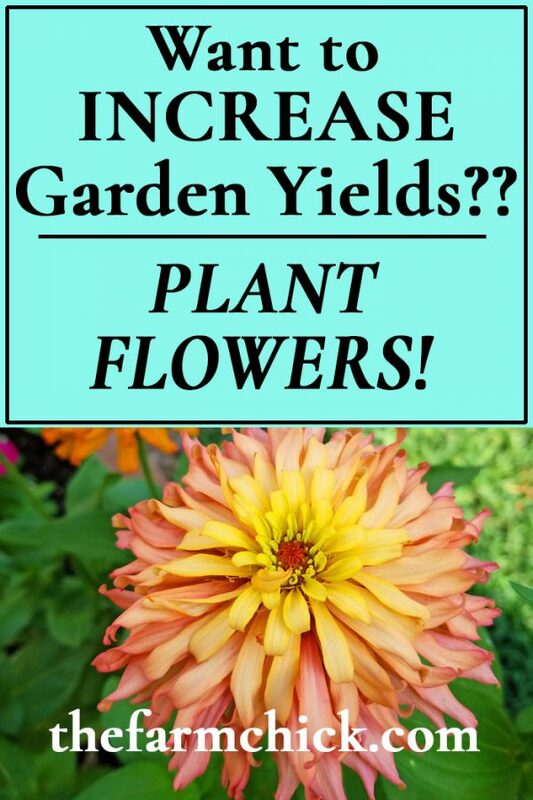 You can do this all season long, plus you can save a lot of seeds once you have your first frost and the plants die back. I save my seeds in a paper bag so they can get air flow and not mold. I also sprinkle seeds around my garden in the fall for some volunteer to pop up in the spring. Trust me, you will get volunteer plants! Both of these flowers are great self-sowers. How many of you plant flowers in your vegetable garden? Any tips or varieties that you love?? Yay! Pretty flowers in the garden! Why yes I do 🙂 I planted marigolds last year for the reasons you listed in the article but I didn’t know about zinnias! I’m definitely going to try them this year. They’re so much prettier than marigolds in my opinion…and I love my hummingbirds! Thanks for the *lovely* tips!! Yes!! I love making fresh flower bouquets!! I love flowers in my garden! I also have herbs for cooking, tea, and medicinal. They also flower. Love all the colors!